There are a fair number of pinotphiles who cherish J. Rochioli Pinot Noir, but who are desperately biding their time on the waiting list, hoping to receive an allocation in the future. Listen up. There is one other option for you. I am hesitant to rave about it because the wines are still somewhat readily available, a situation that will undoubtedly change when the word gets out. Castalia, a small production label (less than 400 cases), currently sources fruit from Rochioli’s treasured West Block selection in River Block and Flax Vineyard and the resultant wines crafted by Rochioli Winery & Vineyard’s Cellar Master, Terry Bering, are crazy good and still relatively affordable. 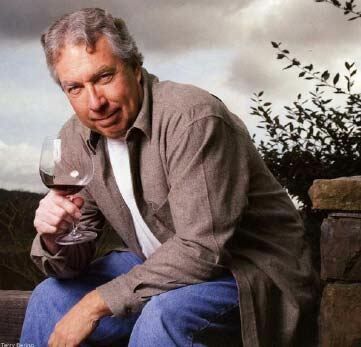 Terry Bering began as a home winemaker in 1983-1984, crafting Cabernet Sauvignon with friends in a Healdsburg carport. Terry admits the wines weren’t very good. He decided to try his hand at Pinot Noir and obtained 5-10 gallons of second crop grapes in the 1985 vintage and purchased grapes in the 1986 vintage. Both wines were early drinking Pinot Noirs made without new oak and were “great.” After meeting Tom Rochioli, Terry worked harvest at Rochioli Winery & Vineyards in 1988 and 1989, obtaining second-crop grapes from Three Corner Vineyard and crafting Pinot Noir that impressed the Rochiolis. Terry gladly left his real estate job when he was offered the position of Cellar Master at Rochioli in 1990 to assist Tom Rochioli. Today he is the only person working at the winery outside of Tom and is an unsung contributor to the success of the winery. Initially, the winery could only pay him $1,200 a month, so he was offered the opportunity to make a small amount of wine under his own label at the winery. He started with 150 cases in 1992, slowly increasing production to 352 cases in 2009. The wines are 100% Rochioli fruit and he is permitted to state, “Rochioli Vineyard,” on the Castalia label (the only producer so anointed). The name, Castalia, refers to a legendary spring on Mount Parnassus in ancient Greece that was favored by Apollo and was said to bestow gifts of poetry and inspiration on those who drank from its waters. From 1992 to 2003, up to 50% of the grapes were second-crop from West Block and about 50% first-crop from River Block. Terry told me, “Second crop grapes from West Block were great and the 2002 Castalia Pinot Noir was a revelation to many wine critics.” By 2004, he was receiving all first-crop including 50% from a 20-year-old block at Flax Vineyard (a vineyard on Westside Road planted from West Block cuttings and farmed by Joe Rochioli, Jr.) and 50% from River Block. With this change in 2004, Terry remarked that the Castalia wines were noticeably “kicked up,” and the 2004 and 2007 vintages were heavily lauded by the wine press. It is clear in talking with Terry that he has a special reverence for Rochioli fruit and takes his responsibility seriously of showing off the quality of the grapes in his finished Castalia wines. “After the main flowering and fruit set takes place, usually around the beginning of summer, vines sometimes set additional clusters on what viticulturists call lateral shoots. Varieties differ in their propensity to set such clusters; Pinot Noir's propensity is high. Generally, second-crop fruit competes with first-crop for nutrients, potentially lessening the quality of the latter; it also ripens later, creating the potential for unripe fruit to find its way into the picking bins at harvest time. For these reasons, second-crop fruit is usually removed from the vines well before harvest and discarded, or carefully separated from harvested fruit on the crushpad.” John Haeger, North American Pinot Noir. 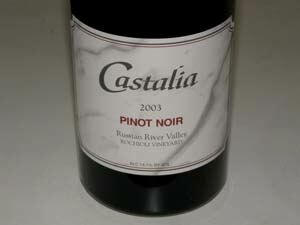 Recently, Terry gathered some fans of his wines and tasted a vertical of Castalia Pinot Noir dating back to 2000. The wines had aged beautifully. He prefers to drink the wines when they are five years old at which time he considers the flavors are at their peak and the wines are very supple. The Castalia Pinot Noirs are carbon copies of J. Rochioli block designated Pinot Noirs, but I feel offer more appealing drink ability early on. That said, the wines still benefit from decanting when young. The pedigree of Rochioli fruit shines in these well crafted beauties. 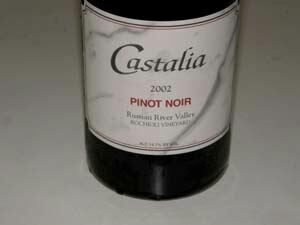 I have been a fan since the 2002 vintage and first wrote about Castalia in the PinotFile in 2004. Recently I had the opportunity to sample a vertical of Castalia Pinot Noir, 2002-2009, and the results left me with even more heightened enthusiasm for the excellence of the wines. These special wines have impeccable balance and stunning finishing length. The wines will easily age 10 years. 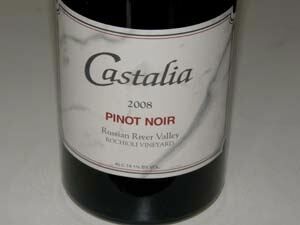 If you can’t get J. Rochioli Pinot Noirs, Castalia is the next best thing and the wines offer superb value as well (the 2009 vintage is $55). Castalia wines are sold through the website in 6 and 12 bottle lots in an old school manner (download the order form on the website, e-mail Terry at dboss@castaliawines.com to reserve your wines, and followup with a check and order form by snail mail). You can also call Terry at 707-857-3376. The 2009 vintage was released February 1, 2011, and is in limited supply. Magnums are produced but sell out immediately. The 2010 vintage yields were down by 50% so this vintage will be in even scarcer supply. Visit the website at www.castaliawines.com. There is limited distribution to fine wine retailers within California. Castalia Pinot Noir is on the wine list at Boulevard, Farallon and One Market restaurants in San Francisco. 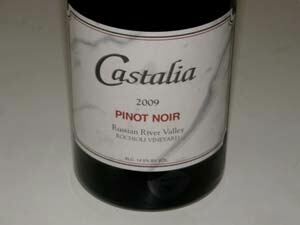 In June 2011 I had the opportunity to sit down and chat with Terry over a bottle of 2009 Castalia Pinot Noir. Listen to the audio: "Interview with Terry of Castalia"
The 2000 and 2001 vintages were not tasted by me but were opened as part of another vertical tasting this year. I have included Terry’s comments on those two vintages. Castalia labels state alcohol as 14.1% but the honest alcohols are included here. Terry feels the intensity of the fruit can balance the higher alcohols and I found that to be the case in this tasting. He notes that grapes from West Block scion have to be ripe to bring out the flavors. The clusters are remarkable with some berries smaller than blueberries creating intense fruit flavor. These wines have remarkably intense fruit flavors but the wines offer finesse over fruit heaviness or jaminess. 14.94% alc., pH 3.64, 300 cases, $35. 50% River Block first-crop and 25% each of River Block and West Block second-crop. · Wellstructured with full flavors. B+. 14.44% alc., pH 3.58, 317 cases, $35. Same vineyard blend as 2000. Warm summer, cool September so harvested later. · Denser and took longer to develop. More structured, French-like. A-. 14.1% alc. (no honest alcohol or pH), 323 cases, $40. Composed of 60% River Block first-crop and 40% West Block second-crop. Perfect season. A 96 pt wine. · Moderately light reddish-purple color in the glass. Complex and alluring nose offering scents of black cherries, sweet pipe smoke, mocha, gingerbread, leaf and underbrush. Intensely flavored with a dense core of black cherry and cranberry fruit. Dreamy soft on the palate with supple tannins and impeccable balance. So fresh and lively, hard to believe the wine was 9 years old. Finishes with a memorable fruit-driven persistence. An amazing, orgasmic experience. 14.1% alc. (no honest alcohol), pH 3.51, 309 cases, $40. Same vineyard composition as 2002 vintage. Warm growing season. · Moderately light reddish-purple color in the glass. Very enticing aromas of pie cherries, berry jam, red candies and a hint of mocha. The wine attacks the mid palate with a vengeance, serving up layers of black cherry and dark red berry fruit set off by hints of cola and sassafras, lingering on the finish for nearly a minute. Beautiful balance, restrained tannins and light on its feet. Finesse with power. Slightly less weighted than the 2002 vintage, but a highly praiseworthy wine in its own right. 15.18% alc., pH 3.53, 320 cases, $45. First year with no second-crop and first year of fruit from Flax Vineyard West Block clone. · Moderately light garnet color in the glass, apparently unfiltered. Impressive aromatic intensity with scents of red berry cobbler, candied cherry and mocha. A plethora of darker red and black fruit flavors with a slight roasted quality, finishing with great length and a hint of citrus peel. Silky textured with gossamer tannins. Very good. All second-crop. · Moderate reddish-purple hue in the glass. The nose offers up aromas of mixed dark berries, smoke and oak. Tasty core of dark raspberries, blackberries and Hoison sauce with noticeable oak in the background. Light in weight relative to other vintages tasted in this vertical and seems a little dilute next to the other bottlings. Still, the wine has plenty of charm and picks up interest over time in the glass. Very good. 14.88% alc., pH 3.58, 327 cases, $45. Very large crop and very hot the second part of harvest. River Block fruit had bad fermentation. Bottles from this vintage have been very uneven. · Moderately light reddish-purple color in the glass. The nose is more savory than fruity with scents of brier and Provencal herbs. A solid, but not spectacular wine that offers a modest amount of dark red Pinot fruits with an underpinning of savory herbs (herbal but not herbaceous) and subtle oak with a dusting of tannins. Good (+). 15.3% alc., pH 3.53, 328 cases, $50. 9 barrels of River Block and 5 barrels of Flax Vineyard West Block clone. · Moderately light reddish-purple color in the glass. Aromas of cherry tart, bacon, straw bale, forest floor and oak. A very silky wine on the palate with generous flavors of grilled stone fruits and toasty, smoky oak. Nicely structured and balanced with mild finegrain tannins and some aromatic persistence on the finish. My only nit is that the fruit is somewhat drowned out by oak-derived flavors. Good (+). 15.3% alc., pH 3.49, 326 cases, $50. 50% River Block and 50% Flax Vineyard West Block clone. Perfect growing season. Very small yields. Aged 15 months in 30% new French oak barrels. · Moderate reddish-purple color in the glass. The nose is striking with vibrant aromas of crushed black cherries, berry jam, and mocha. The palate is rich, long and pure with a generous amount of black cherry and plum fruit accented with notes of tea, cola, clove, cherry skins and herbal oak. Still youthful with the balance and structural bones to age. Liquid nobility. 15.5% alc., pH 3.56, 354 cases, $50. 50% River Block and 50% Flax Vineyard. Warmer growing season. Unfiltered. · Moderately light reddish-purple color in the glass. Gorgeous nose of vivid black cherry and black raspberry perfume complimented by oak. Mature black cherry flavors flood the palate with interesting notes of cherry cola, oak spice, umami and red Jolly Rancher lingering on the amazing finish that seems to last an eternity. Definitely ripe flavored. Perfect oak integration and well matched tannins. Similar to the 2009 vintage. Irresistible. 14.95% alc., pH 3.57, 352 cases, $55. 40% Dijon 115 and 667 for the first time. 50% River Block and 50% Flax Vineyard West Block clone. Perfect growing season with enough warm days to achieve optimum ripening. Aged 15 months in 30% new French oak barrels. · Medium reddish-purple robe. Quintessential Russian River Valley Pinot Noir with typical bright aromas of Bing cherries, red raspberries, dark red roses, and exotic spice. Delicious and polished on the palate with a generous endowment of cherries jubilee, ripe strawberry, raspberry and plum flavors wrapped in well-mannered tannins with a cherry cola and spice box finish that lingers, slipping off the back of the palate and leaving an overwhelming impression of luxury.